One of the incredible benefits of living in Florida is exposure to the biodiversity of our wildlife population. From ordinary squirrels and mockingbirds to the more exotic panthers and migratory tropical birds, it is rare one can step outside the house without seeing or hearing wildlife of some variety. 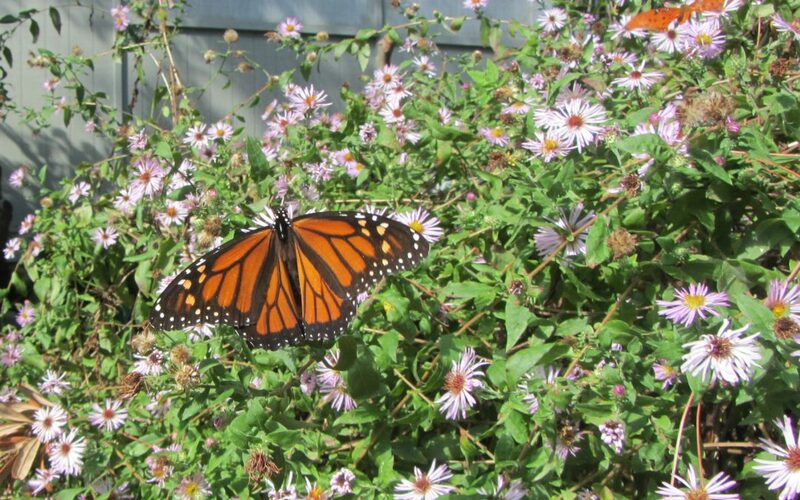 One of the practices we “preach” here at Extension is to provide habitat for wildlife in our yards and gardens. While cities and neighborhoods are human-centric, we share these spaces with thousands of wild animals, birds, fish, and insects and should always consider them in our actions. Attracting birds and butterflies are popular pastimes, and Extension faculty can provide a tremendous amount of information on their preferences and food sources. However, a few unsung critters deserve homes and space as well. Just yesterday, I took a call from a gentleman who was excited to discover a small colony of bats roosting in a tree on his property. He was looking for ways to encourage them to stay, because he realized the countless benefits they provide in free insect control. Many people are nervous around bats of because of their unpredictable, irregular night flight pattern and association with scary stories. However, an average Florida bat can eat 1,000 insects a night, keeping pest populations down, reducing mosquito-borne disease, and saving millions of dollars in crop damage. 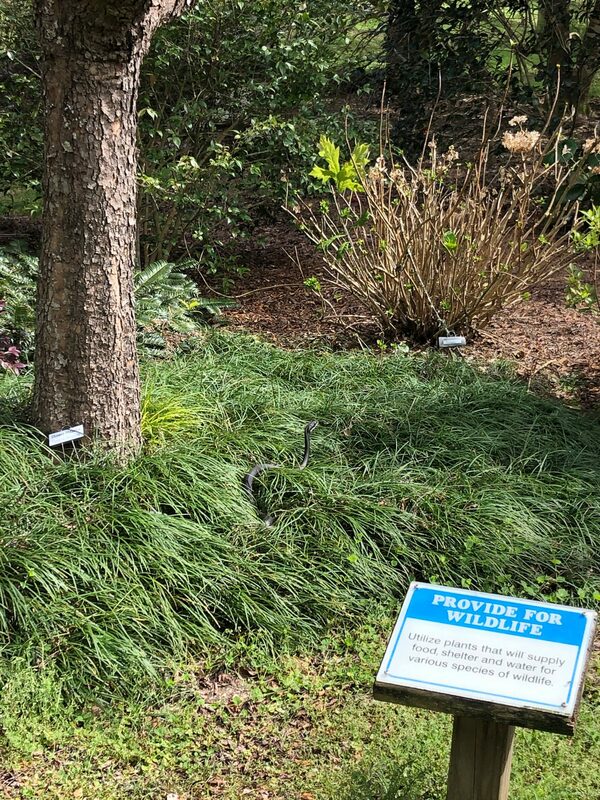 In our demonstration garden today, I was delighted to walk up on a black racer sunning itself in the grass. These common garden snakes provide valuable pest control of rats and mice, and are not aggressive or venomous. The fear of snakes often comes from the surprise of finding one unexpectedly, so always be alert and observant when outdoors. Respect for these creatures and a basic working knowledge of common venomous and nonvenomous species can go a long way towards calming one’s nerves. An excellent resource for snake identification in north Florida is this online guide. Like many snakes, this particular snake had been in tall grass, so it is always wise to be cautious in those areas. To attract wildlife, learn about their life cycle and food sources, and provide shelter, water, and food for the species you are interested in attracting. Keep in mind that inviting wildlife may also draw their predators, but know that this is part of the larger cycle. Always keep safety in mind, and if necessary keep tall vegetation and deep water to a minimum in play areas frequented by young children. The benefits of providing food and shelter for wildlife are countless for human observers and wildlife alike. Each time I travel to central and south Florida and observe the wonderfully flamboyant tropical flora, I am reminded of the unique and frustrating climatic characteristics of Northwest Florida. Our weather is tropical enough through the summer to sustain virtually everything our friends to the south grow, but winters north of the Big Bend are just cold enough to prevent long-term success with most tropical species. However, the genus that is maybe most synonymous with tropical color, the Hibiscus (it even has its own texting emoji! ), contains several species that are hardy through our winters. 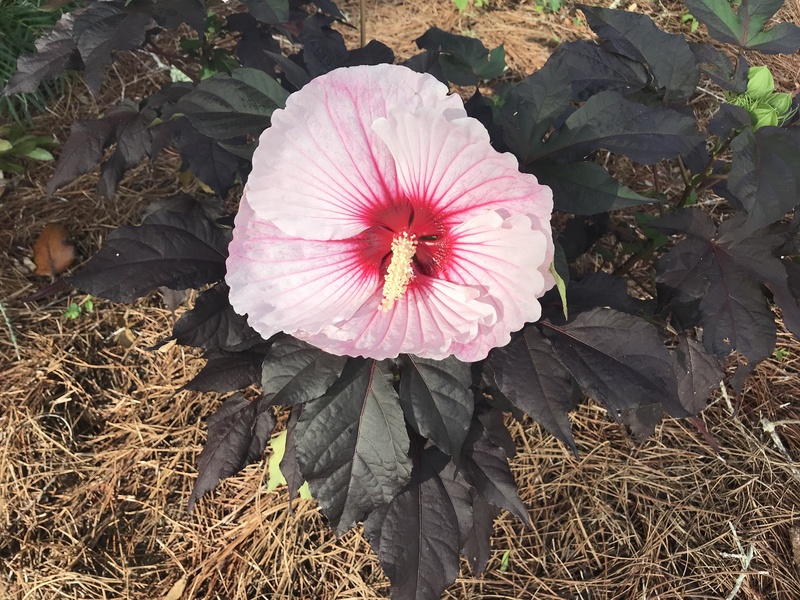 The best landscape plant of these hardy Hibiscus species is creatively (sarcasm) called Hardy Hibiscus or Giant Rose Mallow (Hibiscus moscheutos) and is an absolute star in the Panhandle, bringing the beauty of the tropics to your yard! Summerific® Series by Proven Winners. This series is comprised of four robust (up to 5’ in height) cultivars, ‘Cherry Cheesecake’ (bicolor magenta and white flowers), ‘Berry Awesome’ (purplish lavender flowers), ‘Cranberry Crush’ (a red you really have to see to believe), and ‘Perfect Storm’ (notable for its deep purple foliage). Luna Series by Monrovia. This series is notable for its ultra-compact (3’ in height or less) size and characteristically large flowers. It is also composed of four cultivars, ‘Luna Red’ (deep red), ‘Luna Blush’ (white, fading to pink near flower margins), ‘Luna Pink Swirl’ (pictured and my favorite, bicolor swirly flowers), and ‘Luna White’ (white with a red center). ‘Starry Starry Night’ by Walter’s Gardens. (Pictured) This cultivar combines dark purple to black leaves with swirled pale and dark pink flowers. It has performed very well in my landscape and if I could only grow one, this might be it. ‘Lord Baltimore.’ The classic, large growing cultivar with bright red flowers that is widely available and easily found. An oldie (introduced in 1955) but a goodie. ‘Midnight Marvel’ by Walter’s Gardens. A “hot off the press” new cultivar that is currently difficult to find due to popularity, though some online outlets have them available in small sizes. This one is worth your patience. Sporting deep red blooms on near black foliage, there’s nothing else like it in the landscape. 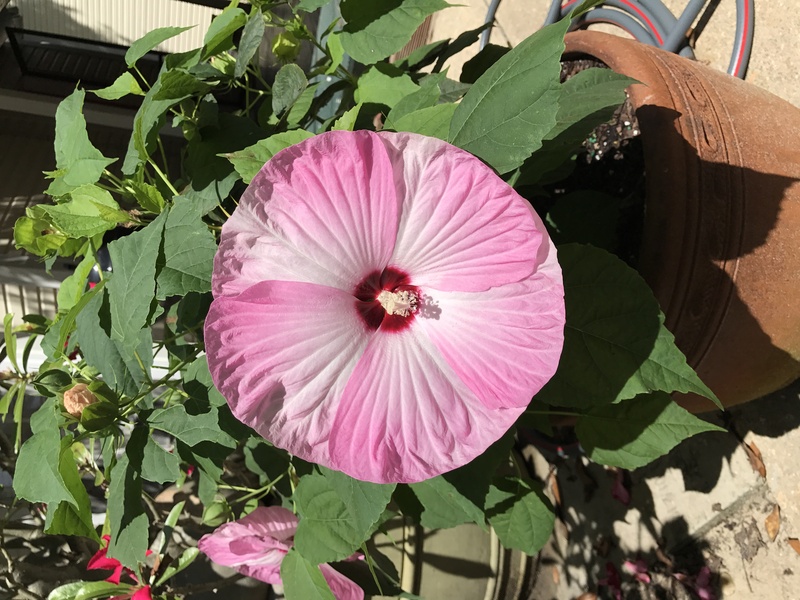 In addition to being gorgeous plants, Rose Mallows are extremely versatile in the landscape and could not be easier to grow. Because the size varies so greatly (from the diminutive 30” tall ‘Luna’ series to the 8’ tall unimproved species), there really is a place for one in every garden. 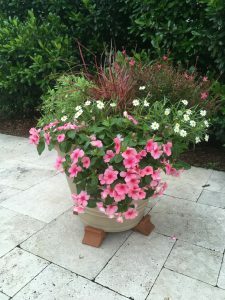 I like to use the smaller cultivars in large containers to facilitate moving them around where their floral display has the greatest impact or to create a tropical effect where in ground plantings are not an option (pool decks, patios, etc). The larger cultivars make spectacular specimen plantings in perennial and shrub beds and even make a really dense, striking hedge (just know they disappear in the winter). Be sure to give them as much sun as possible, as this will enhance the number of flowers on each plant and darken the foliage on the cultivars with purplish/black leaves. Too little sun will result in fewer flowers and lighter green foliage. 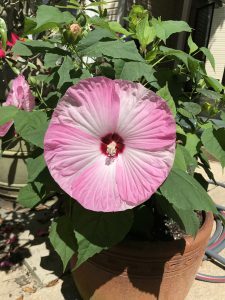 As wetland plants, Rose Mallows enjoy regular water, either from rainfall or irrigation; they will let you know when they need it – their large leaves readily wilt under drought stress, somewhat like Hydrangea. For low-maintenance, native, pollinator friendly, cold-hardy tropical color, you need look no further than Rose Mallow. 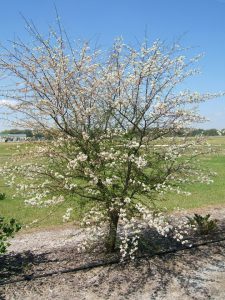 These perennial shrubs come in all sizes and colors and fit any landscape! Look for the above listed series and cultivars at better garden centers and online retailers and enjoy the oohs and ahhs elicited when people first get a glimpse of Hardy Hibiscus in your landscape! Happy Gardening! It’s that time of year. School is out, hurricane season is in, and the mercury is up! Gardens wilt by midday and gardeners retreat into the air conditioning long before then. Unless you have your toes in the water on one of Northwest Florida’s beautiful beaches, it can be a miserable time to be a Floridian, for plants and people! However, despite the relentless heat and blistering sunshine, low-maintenance, eye-catching color can still be had in the landscape. 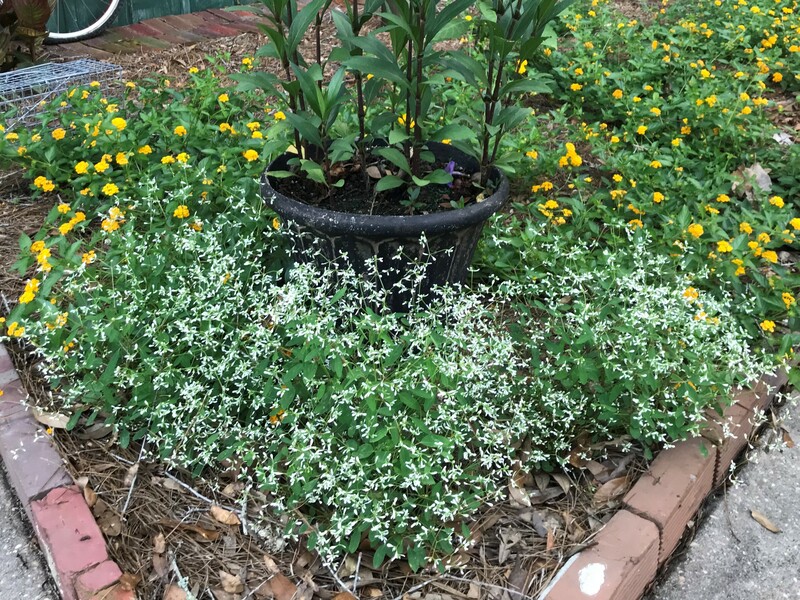 When the calendar flips to June, I turn to my two favorite Florida-Friendly annuals to do the heavy lifting in my landscape: ‘Diamond Frost’ Euphorbia, and the ‘Cora’ Vinca series. A relative newcomer to landscapes, the award winning ‘Diamond Frost’ Euphorbia is an amazing introduction from Proven Winners. The ultimate in tough, ‘Diamond Frost’ does great both as a mounding accent in a container or as a standalone bedding plant in the landscape. Though its individual, teardrop-shaped, white flowers are tiny, the hundreds of them that open each day really pack a floral punch in the landscape! One caveat: if planting in the landscape, I find ‘Diamond Frost’ to be most effective massed in groups of three or more. Due to the daintiness of the flowers, a single plant can get lost among other garden inhabitants. However, when done right, ‘Diamond Frost’ is a proven winner in any landscape! 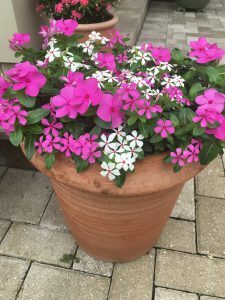 Next, the ‘Cora’ series of Vinca (Catharanthus roseus), also introduced by Proven Winners, is an improvement on an old favorite. Note: This species is also, on occasion, called Periwinkle. However, do not confuse it with the spreading, purple-flowered, perennial groundcover of the same common name! Gardeners in the South have been growing Vincas for years. This species is unbelievably tolerant of harsh conditions, sometimes even seen growing in sidewalk cracks! However, the unimproved species had an Achilles heel: susceptibility to Phytophthora, a devastating fungal rot disease. ‘Cora’ overcomes this issue and is as close to a perfect bedding annual as you’re likely to find. The ‘Cora’ series is composed of cultivars with pinwheel-shaped white, pink and lavender flowers, a color for everyone! The kind (and clever) marketing folks at Proven Winners have even made ‘Cora’ easy to spot on retail nursery benches; just look for the plants in the hot pink containers! Both of the above-described plants are extremely undemanding of gardeners. 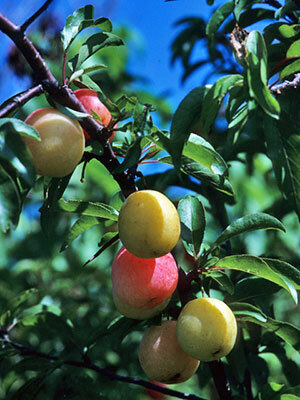 Once established, little is required in the way of irrigation and fertilization. To ensure success, water daily for the first week after planting, back off to a couple of times per week for the next two weeks or so and then watch ‘Diamond Frost’ and ‘Cora’ thrive with only rainfall for the rest of the summer! 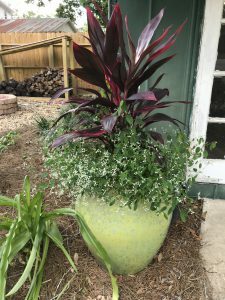 Keep in mind, during periods of excessive drought, supplemental watering may be required to keep any plant, even drought tolerant ones, looking their best! To meet the minimal nutrition demands of these plants, I incorporate a quality, slow-release fertilizer (for example, Osmocote, Harrell’s Polyon, or any other similar product) at planting. These products last two or three months in our rainy, hot, humid climate and generally need a second application accordingly for full-season performance. ‘Diamond Frost’ Euphorbia and ‘Cora’ Vinca also require full, blazing sun for maximum floral performance. Don’t be shy about siting them in harsh, sunny places, even a few hours of shade tend to make leggier plants that flower less! 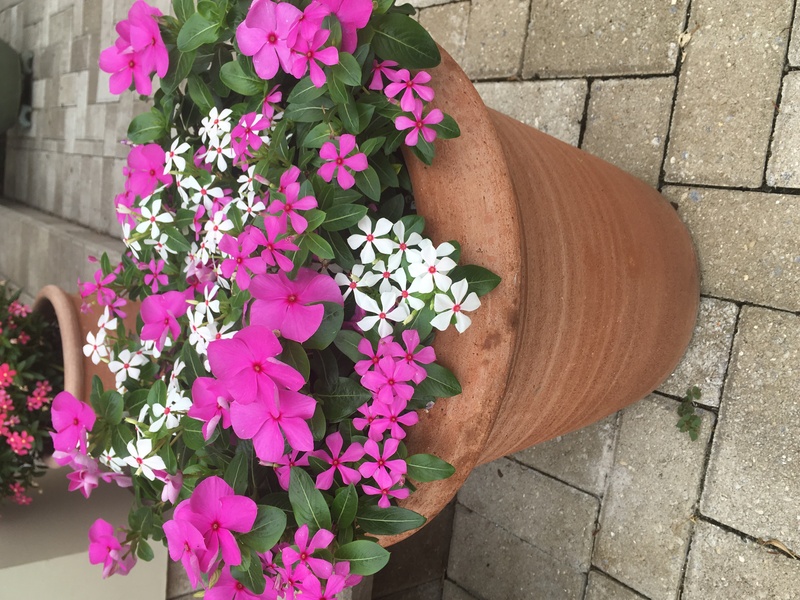 When you need low-maintenance, season long color that can beat the heat, look for ‘Diamond Frost’ Euphorbia and the ‘Cora’ series of Vinca at your local nursery! Stay cool out there folks and happy gardening! 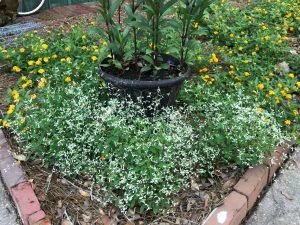 The change in North Florida temperatures from cooler to warmer is making many winter weeds more noticeable as they begin to flower and form seed. Not all of these plants should be considered for mowing or hand pulling. There are several wildflowers that grow in landscape beds and thinning areas of lawns and can be enjoyed before consistent heat returns. One very delicate wildflower that is growing now is the Toadflax, Linaria canadensis. 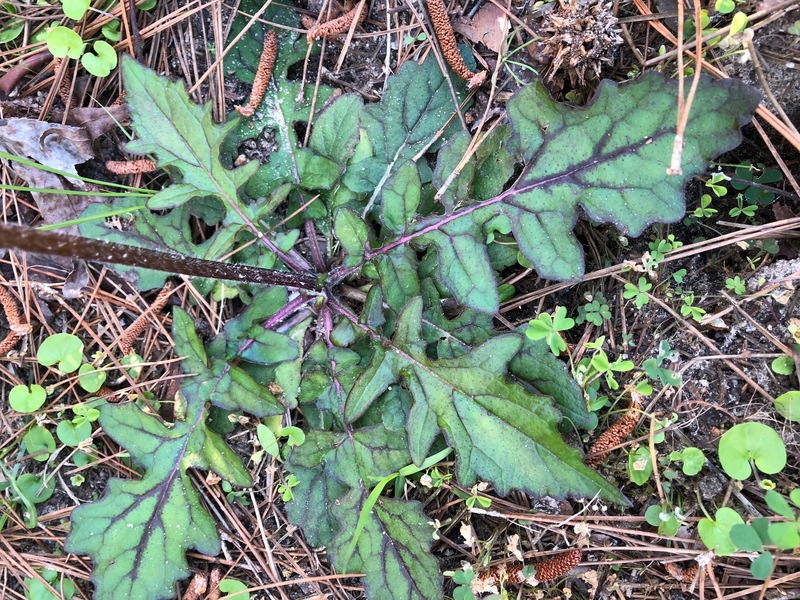 The leaves are very small and grow low on the ground. 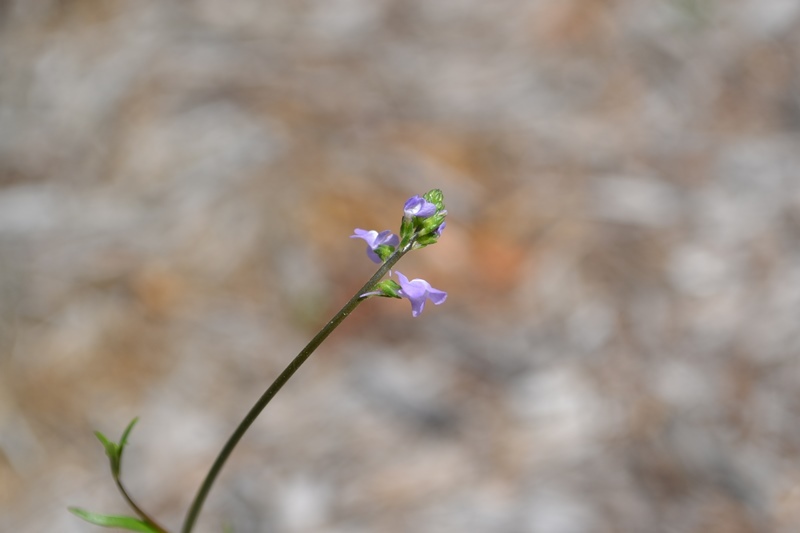 Thin flower stalks grow several inches and are topped with light purple flowers. Although toadflax pops up in beds and lawns don’t be so quick to pull it out. This wildflower is a host to the Buckeye butterfly, one of our earlier visitors to gardens. If you look closely you may even see the tiny black, spiny caterpillar eating toadflax leaves. 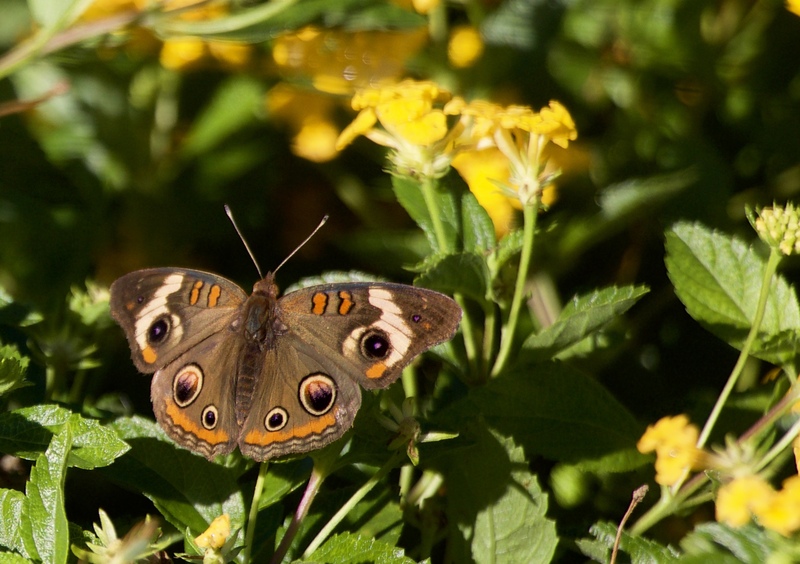 Visit the UF publication on the Buckeye butterfly to learn more. The spike of lavender blooms of lyreleaf sage. Photo credit: Mary Salinas. 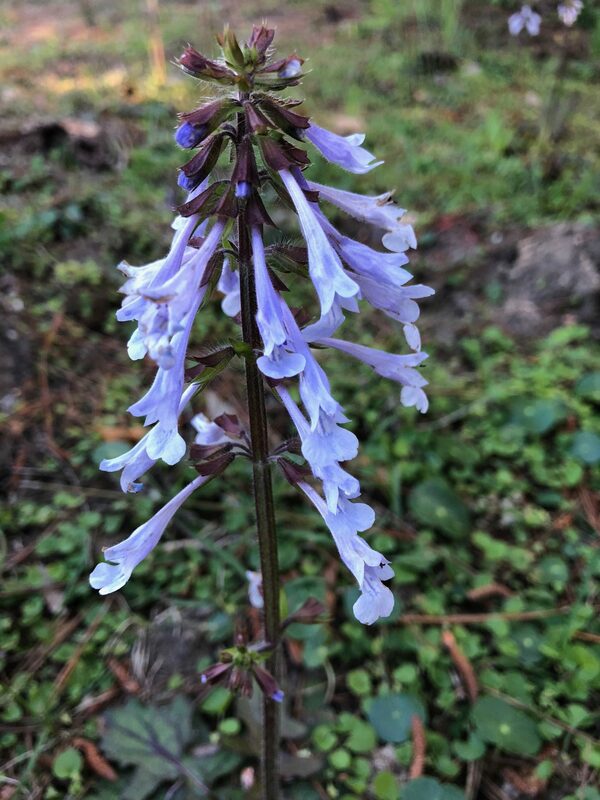 Spring wildflowers are popping up along our roadways and along woodland edges. 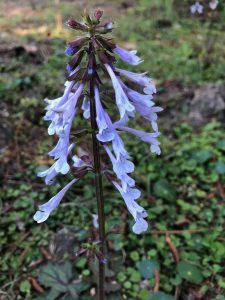 One of our native perennial beauties you can enjoy right now is lyreleaf sage, Salvia lyrata, with spikes of tubular lavender flowers rising about a foot above the ground. The blooms, which occur late winter through late spring, attract bees and butterflies and provide them a good source of nectar. It also is a good host plant for aphids, which in turn, can make it a good banker plant and feeding station for ladybug larvae. The irregularly-shaped leaves grow in a rosette hugging the ground and can make for a natural ground cover in part shade areas. 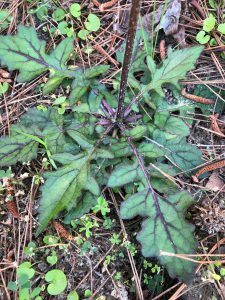 These attractive leaves are easily identifiable by their purple stems, edges and veins in sharp contrast to the bright green of the rest of the leaf. Lyreleaf sage belongs to the mint family and shares the characteristic square-shaped stems and two-lipped flowers. Leaves of lyreleaf sage form a ground hugging rosette. Photo credit: Mary Salinas. Whatever garden conditions you have, lyreleaf sage should be able to adapt. 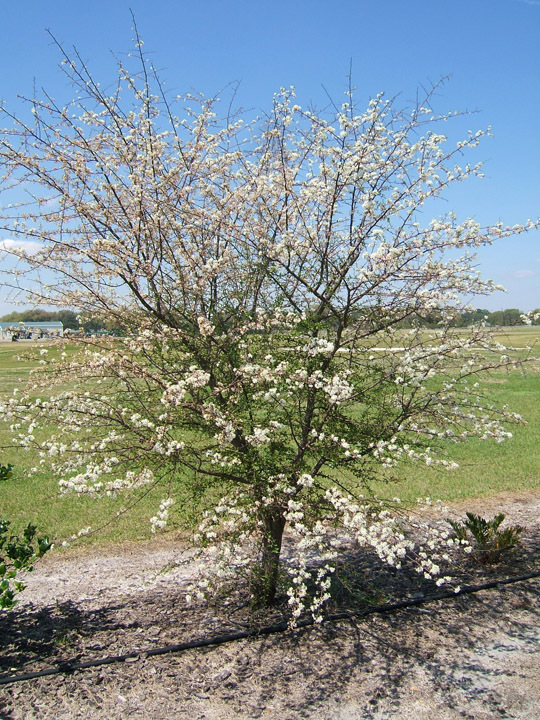 It tolerates drought, flooding and most soil types. Be aware, though, that this beauty produces lots of seed and can spread quickly. This can be a very desirable trait for establishing a wildflower meadow but challenging if you want to keep it contained in a small area. To manage its’ spread, remove flower spikes after the blooms fade to prevent most seed formation. Lyreleaf sage can usually be found in native plant or local nurseries; seed can be found through online wildflower seed sources.